Looking to replace your computer or add another to the family? Maybe you're interested in a tablet, or looking for an external hard drive, case, or other accessory for your computer. We carry a variety of computers, parts and accessories - and if we don't have it in stock, we can order it, with fast shipping. We carry a full line of Apple computers, including MacBook, MacBook Air, MacBook Pro, MacBook Pro with Retina display, Mac mini and iMac. We carry brand-new Macs, refurbished late-model Macs, and everything in between. We also often have higher-end configurations of Macs that you can't normally find in stores. Many people are replacing their computers with an iPad to meet their mobile needs. We stock a large selection of refurbished iPads, and have the ability to order any configuration of any iPad model - including the entire iPad, iPad mini, iPad Air and iPad Pro lineup. Not a Mac person? We carry a large selection of Dell laptops and desktops, and can order you anything from their lineup - so whatever your needs are, we can find the perfect PC for you! 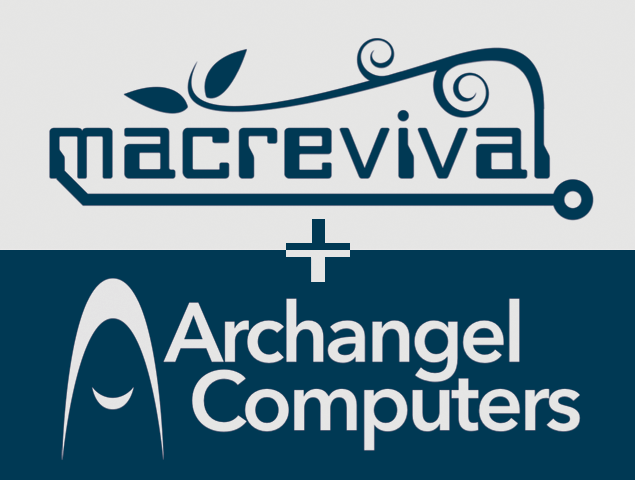 If power and performance are key for your needs, Archangel offers a line of custom-build PC desktops to fit your needs. We can build high-end systems for gaming or 3D modeling, and even build simple desktop towers for email and web browsing that will save you money over a pre-built system. We carry a large selection of accessories for Apple devices, PCs and tablets - everything from mice, cases, cables and backup hard drives. And if we don't have what you're looking for in stock, we can order it - and usually have it here in 3 business days or less! Along with stocking accessories, we have access to a large library of software packages. Popular software packages we sell include Microsoft Office, Adobe Creative Suite (Photoshop, Illustrator, etc), QuickBooks accounting and POS software, Dragon Dictation, and others.